I am so excited to have come across this wonderful community and marketplace. I’m looking forward to enjoying the offerings here, and to share my own! Hi there! I’m Sarah, the artist behind Creature Comfort Craftworks. After a move that took me away from the dyepots for a time, I’m back at it and enjoying the heck out of playing with color, fiber and yarns again. Slowly but surely, the inventory is trickling in again and I can only hope good things are in store, not only for me, but for all of us. Most recently, I have been adding gradient palette sets to my shop. 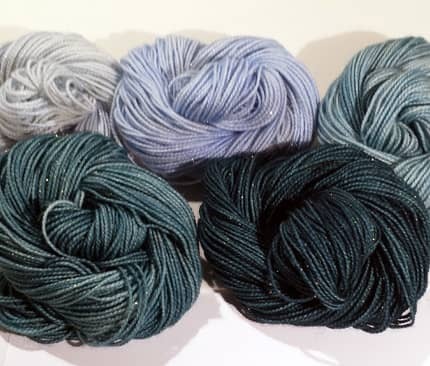 These are four and five mini-skein sets that, if knit or worked together in a project are sure to add some color love to the finished whatever-it-might-be.